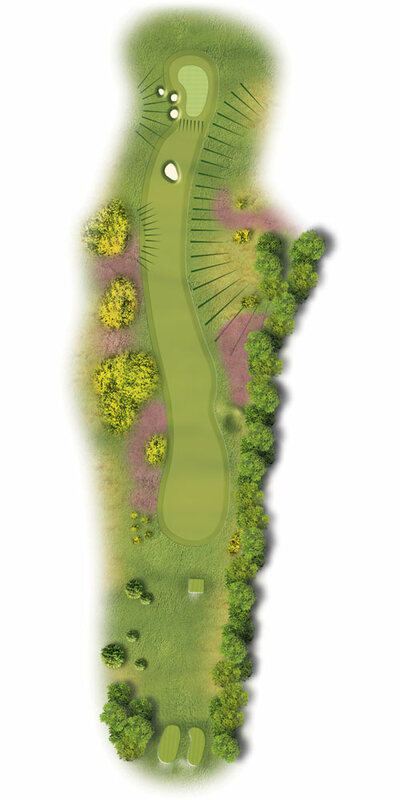 A hole that demands precision from tee to green and a good strategy. A driver will take you past the narrow bottleneck of a fairway and leave a short iron to the green – but still demands great accuracy. A long iron/fairway wood may be the safe option but then demands a longer shot into a small target. The uphill second to the top of the valley always plays longer. A hole that can strike fear into many golfers but played sensibly will avoid a big score. A three shot strategy may be the best option driving into the wider fairway, followed by a mid-iron to the next section of wider fairway short of the pot bunker and a pitch up to the green. Try to avoid getting past the pin – otherwise a fast downhill putt is ahead of you!